Berthe Marti (1904-1995), a native of Lausanne, Switzerland, moved to the US in 1925 to begin graduate studies at Bryn Mawr College, where she received her PhD in 1934. 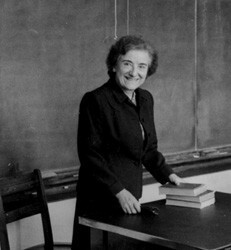 She began teaching classical and medieval Latin at Bryn Mawr in 1930 and remained there until 1963. In that year she moved to Chapel Hill, where she taught in the Department as professor of classical and medieval Latin until her retirement in 1976. For most of this period, she spent each fall in Rome, working on research projects in the American Academy in Rome and the Vatican. She published widely, especially on Lucan and his medieval commentary tradition. By her students, both undergraduate and graduate, Marti was known as a lively, exciting, and demanding teacher. Exceptionally generous with her time in assisting and supporting her students, she took special delight in introducing young people to the city of Rome and to the scholars, both Italian and American, who passed through the American Academy in Rome. For a more detailed account, see here. The Berthe Marti Fund was established in Professor Marti’s memory in 1996 with gifts from friends, colleagues, and students. It is used to provide travel grants to students who wish to travel to Europe to study Latin or medieval literature, the Latin language, or Roman civilization, especially to graduate students participating in the Classical Summer School of the American Academy of Rome. Please consider making a gift online to the Berthe Marti Fund (107404).